The star of this game is so efficient at killing monsters that he doesn’t need to work full time. That’s why they call the game Part Time Hero: Monster Mayham. The Android app combines sword fighting through a world of monsters while collecting gold and jeweled treasures, building up energy levels, and unlocking 10 different chapters. Your hero an choose the monster he wants to fight and choose a sidekick to help with the battles. He can also take a break to work odd jobs which bring in cash to pay sidekicks and purchase weapon upgrades. Energy rewards include weapons such as electric shock or the blade storm, which will quickly wipe out groups of monsters. 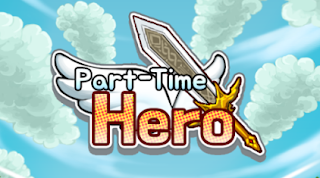 Part Time Hero: Monster Mayham is available as a free download in the Google Play Store.